Automatic cloud-based monitoring for infrastructures and buildings. Monitoring is essential to assessing and predicting landslides or ground structural weaknesses, which could affect buildings or infrastructures. To get accurate information over areas subject to subsidence or slow moving landslides, in order to anticipate potential risks, is fundamental for organizations and professionals working in civil protection, master plan management and insurance. Rheticus®Displacement is an automatic cloud-based geoinformation service designed to deliver fresh and accurate satellite-based data and information for the monitoring of ground surface movements. stability of infrastructures (e.g. dams, bridges, buildings, road and railway networks, pipelines, electric towers, solar and wind farms, and so forth). Using European Copernicus Sentinel-1 open data or COSMO-SkyMed data images and persistent scatterers techniques, the service is complementary to traditional survey methods, providing a long-term solution to ground instability monitoring. Check of the results of the interventions of slope stabilization. Visit www.rheticus.eu and discover the LIVE DEMO data available. Timely identification of subsidence phenomena and landslides, optimization of on site monitoring activities, planning of emergency maintenance interventions. Article "Rheticus: low-cost satellite monitoring services on the cloud"
Article "MM SpA uses Rheticus to monitor ground surface movements over Milan's sewerage network"
Article "Building a simple answer to a complicated subsidence problem"
Article "Monitoring integrity of water networks with satellites"
Article "Cloud based geoinformation services for coastal water quality and marine resources"
Article "Planetek Italia Uses Hexagon Smart M.App Technology to Build and Deploy Geoinformation Services"
Rheticus® provides timely information that fits the needs of a growing number of business (applications). The information is provided as a service and includes maps, reports and geospatial indexes, designed to monitoring several phenomena. Territorial changes, urban dynamics and land use changes, ground displacements, landslides and infrastructures stability, new infrastructure and construction areas, wildfire burned areas or coastal sea waters quality. Accessing directly to open data images (i.e. Copernicus Sentinel, Landsat 8 satellites), cartographic data and environmental information, Rheticus® provides timely information over the chosen area. Depending on the application, the service is provided on a monthly up to a daily base. Subscribed users can access the information from multiple devices, such as personal computers, tablets & smartphones. Once logged in, users access to a personal area which consist of a dashboard designed to display summary information and user friendly analysis tools, which opens users to a complete set of information over the phenomena. Rheticus® guarantees always the best quality-price ratio available on the market, thanks to the use of open data, automatic processing procedures and its cloud based architecture. 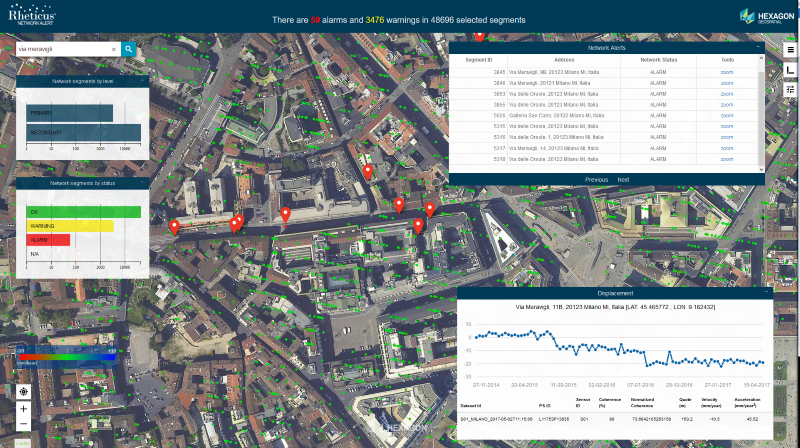 Read the article "Rheticus: low-cost satellite monitoring services on the cloud"
Landslides, subsidence, infrastructures as buildings, roads, railways. Mapping of marine areas with high fishing rates. Monitoring the dynamics of urban areas to identify the anthropic changes such as the construction of new infrastructures, works and urban settlements. Here following the Rheticus® services Authorized Distributors and their respective geographic areas.